“I shall never write a symphony!” Brahms, nearing 40 and already one of Germany’s most famous composers, was adamant in the letter he wrote to a friend. “You can’t have any idea what it’s like always to hear such a giant marching behind you!” That giant was Beethoven, and the shadow he cast over Brahms was nearly inescapable. At the time when Brahms swore off symphonies, it had been almost 20 years since he had converted his first failed attempt into a piano concerto. Starting anew in 1862, he wrote and then abandoned themes for a symphony in the fateful key of C minor, the home key of Beethoven’s Fifth Symphony. When he wrote that letter in 1872, Brahms seemed ready to spare himself the anguish and humiliation of trying and failing again in the signature genre of his greatest hero. And yet, Brahms still returned to his First Symphony — it was the only way he could break out of Beethoven’s intimidating stride. 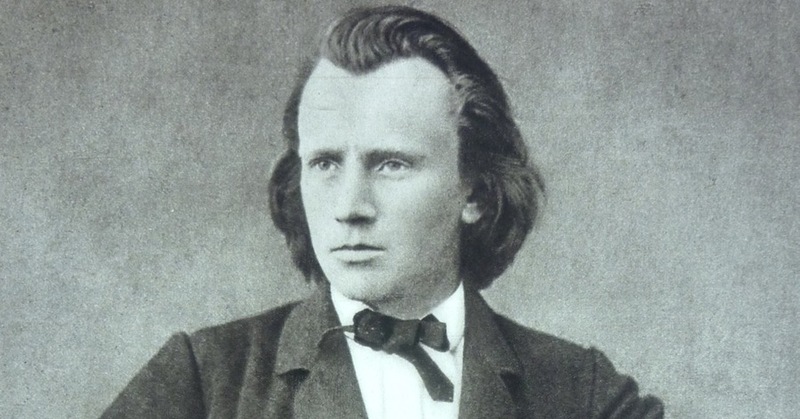 Approaching the problem obliquely, Brahms made two major breakthroughs in 1873. One was the completion of his first pair of string quartets, another realm in which Beethoven’s achievements had long thwarted Brahms’ progress. The other was the release of his first major orchestral work without a soloist, the Variations on a Theme of Haydn. The novel format allowed Brahms to sidestep his symphonic hang-ups while still honing his skills of orchestration and large-scale structure. Building on that confidence, Brahms returned to his earlier draft of a C-minor Symphony, and worked on it from 1874 through 1876. He continued to tinker with the score during rehearsals for the debut that November, and he made further revisions in 1877, until he finally let his publisher release the long-awaited Symphony No. 1 in C minor, Op. 68. Brahms made no attempt to hide his charged relationship with Beethoven in the First Symphony. There are clear echoes of Beethoven’s Fifth Symphony in the harmonic journey from C minor to C major, and the unmistakable interval of a falling major third — the same drop that begins Beethoven’s Fifth — appears in particularly tense moments. In the finale, a chorale theme resembles the famous “Ode to Joy” of Beethoven’s Ninth. Brahms was hardly bashful about this public grappling with Beethoven; in response to a friend who noted the similarities, Brahms quipped, “Any[one] can see that!” The conductor Hans von Bülow was the first to call the symphony “Beethoven’s Tenth,” an honorific that acknowledges the surface-level parallels while also recognizing Brahms’ hard-earned mastery of Classical form and structure. In the end, Beethoven’s legacy acted on Brahms like a refiner’s fire, bringing out the purest and most precious aspects of his musical personality. A long time had passed since Robert Schumann, upon meeting the 20-year-old Brahms, predicted, “When once he lowers his magic wand over the massed resources of chorus and orchestra, we shall have in store for us wonderful insights into the secret of the spiritual world.” With the First Symphony, Brahms laid his demons to rest and unlocked those insights and secrets that still hold us in thrall.